Multi-instrumentalist Ken Vandermark and drummer Paal Nilssen-Love have been pillars of he free jazz scene for decades, and simpatico partners for nearly that length. They have recorded together in any number of configurations, but this might be the most interesting, live duo performances spanning several countries, some of which of which had excellent musicians sitting in with the duo. Without a bassist, you might think this music would be difficult to make it as an improvised format, or its centrifugal force would collapse but this is not so as the musicians reach a mind meld level of connectivity. We learn this quickly on the first two discs recorded in Moscow. There are potent and exciting tenor saxophone and drums duets, developing into a great free-flowing conversation. Politics and worldviews may change and differ, but music crosses all borders as proved by these spacious, yet powerful duo performances. The two musicians have a compatible relationship playing together, understanding speed, tone, complexity and space. 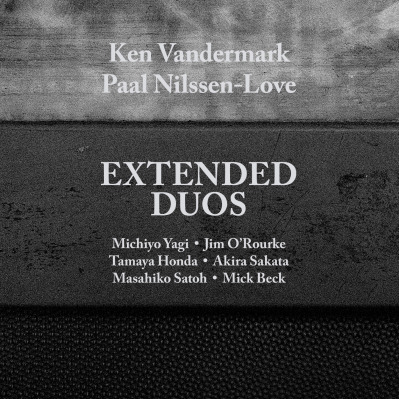 That fact is brought to bear, as Nilssen-Love remains an ever-potent force on drums and percussion, while Vandermark deploys his saxophones along with clarinets with great facility. Things get even more interesting as they move to other cities and interact with some of the finest improvisers available. Moving to Tokyo for three discs, the duo takes on two separate improvisers, performing with pianist Masahiko Satoh on the first half of the disc and American electric guitarist Jim O’Rourke on the second half. The tracks with O’Rourke are particularly interesting because he brings in a no holds barred sensibility of post-rock and avant-garde music that takes the music in a completely different direction. They even add extra saxophone and clarinet and drums at one point, in addition to the fascinating and exiting sound of the electric and acoustic koto. You get to see them up close and personal on the DVD recorded in London, where flutters and taps develops to howls and slamming beats and then back again. Tenor saxophonist Mike Beck adds even more heft (if that’s possible) to the concluding track. Finally back home (for Vandermark anyway) at the Hide Out in Chicago, for the finale of the exhausting set, the listener may be overwhelmed, but the musicians not at all as they tear through another high energy set that seems like it could go on forever. This is music that was deserving of being recorded in this depth and detail. It was a fine example of two great musicians being locked in the moment with appreciation of their partner’s strength and the openness to welcome others. The music is vigilant and free over the course of different textures and patterns, and constantly engaging to the listener. 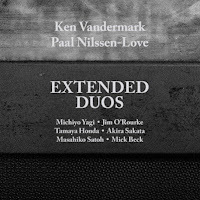 Ken Vandermark and Paal Nilssen Love - Extended Duos Catalytic Sound.